Declines in trading volumes during June 2017 were the general trend for GTX, FastMatch and Hotspot. The volatility of May 2017 caused by the French elections and other political developments led to all major Electronic Communication Networks (ECNs) showing declines month-on-month (MoM) in terms of trading volumes. However, a different image emerges when viewing the figures on a year-on-year (YoY) basis, especially for one of the networks. GAIN Capital’s institutional unit GTX has just reported its latest monthly turnover for June 2017, which declined across both ECN + SEF and swap deals, in contrast to growth recorded in May. In terms of the total turnover of ECN + SEF and swap deals, GTX dropped 12 per cent from $306.5 billion to $270.1 billion. The sharpest decline was seen in swap deals, which declined by 46 per cent down compared to May 2017. Accordingly, the average daily (ADV) trading volume was down 8 per cent MoM, totaling $12.2 billion in June 2017 compared to $13.3 billion in May 2017. 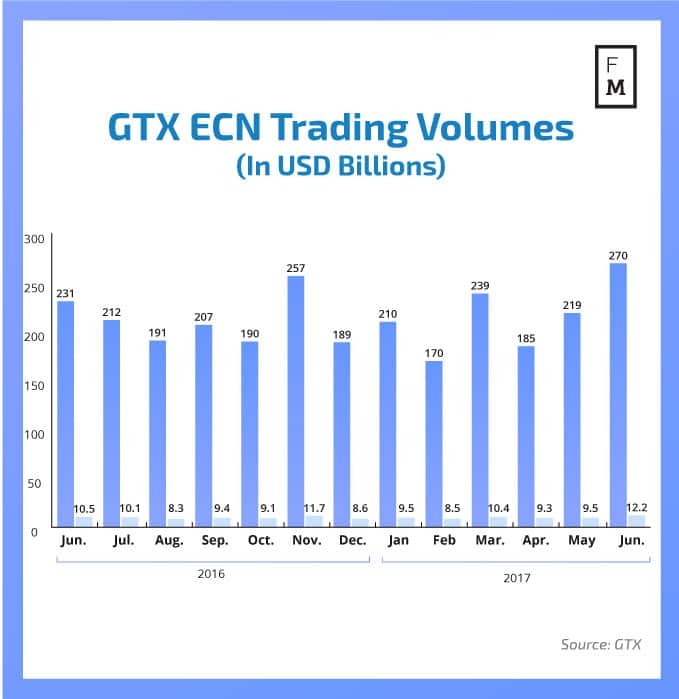 However, YoY the trend is quite the opposite – compared to June 2016, total traded volumes were up 2 per cent, as was the average daily volume. 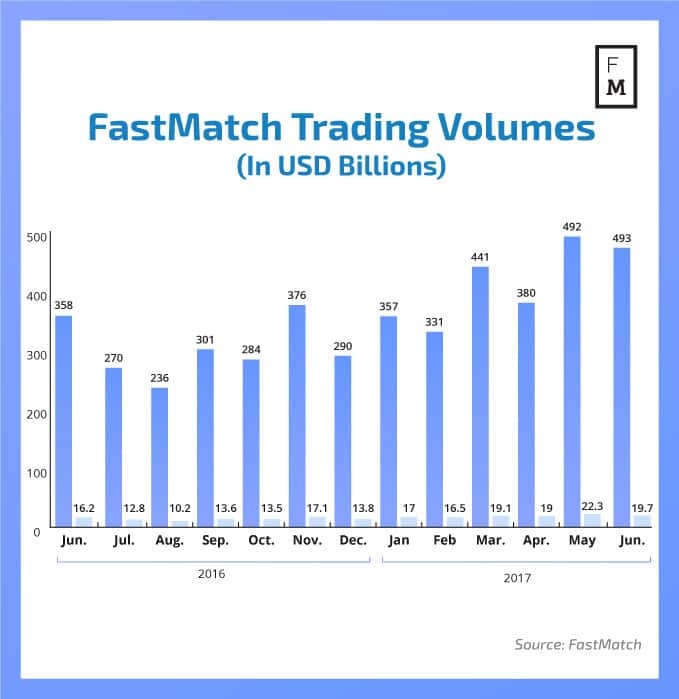 Trading volumes at FastMatch in June 2017 followed the same trend as those of GTX. In terms of total traded volumes, it saw a decline of 16.6 per cent, from $518.4 billion in a volatile May 2017 to $433 billion in June. Compared to June 2016 however, volumes were up, with a staggering 21 per cent growth YoY. ADV during the previous month was 14 per cent lower than the month before, with $19.7 billion compared to $22.5 billion in May. ADV figures year on year were up 21 per cent. Foreign exchange electronic communications network Hotspot has been the most stable ECN in terms of change in traded volumes on a month on month perspective. The company reported a 3 per cent decline in June 2017 compared to May – $613.97 billion versus $647.3 billion respectively. Hotspot registered least growth on a year on year basis, with only 3 per cent growth in total volumes. As to its ADV, Hotspot reported a $27.9 average daily volume, which was flat MoM, and a decline of 3 per cent compared to June 2016.